Prefer a video of this content? 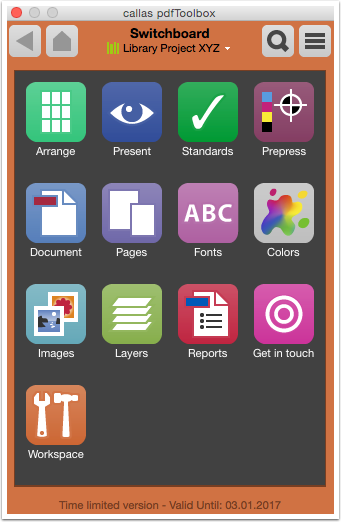 Watch the pdfToolbox Library video. 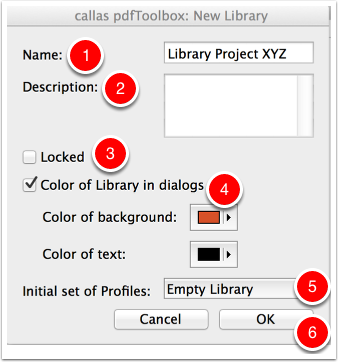 In pdfToolbox 8.1, callas introduced the possibility to work with libraries. 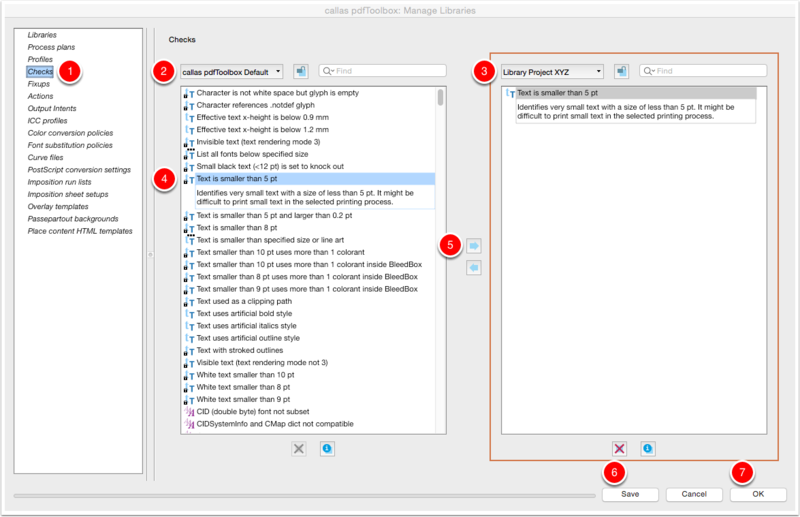 Libraries are repositories for all the different items you can create in pdfToolbox (such as checks, fixups, profiles, process plans, imposition layouts...). You can use them to keep yourself organized on different projects, separate development from production profiles and much more. 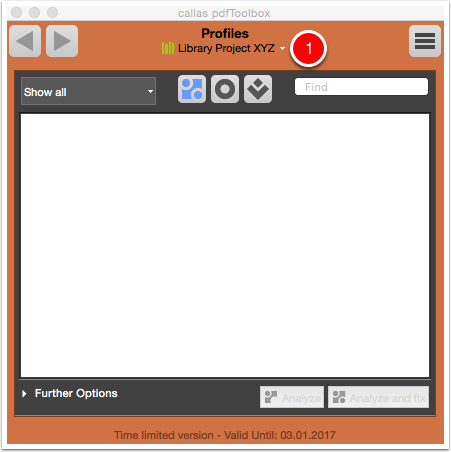 In the Libraries list the default "callas pdfToolbox Default" library is shown. In the "Name" field save the new library as "Library Project XYZ". If necessary you can add a description for the new library. No extra information is needed for this library. The new library can be locked in order to protect them from changes. I choose to not do that. 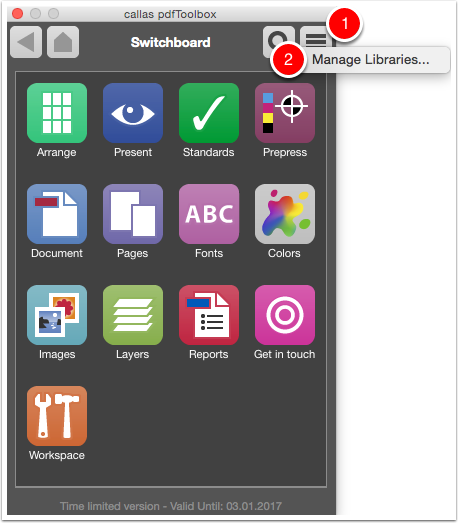 For an improved overview library overview the color of the background and text dialogs can be customised. You can prefer to start with an empty library or using the entire library with the default settings. I choose to start with an empty library. Click "OK" to save the new library. 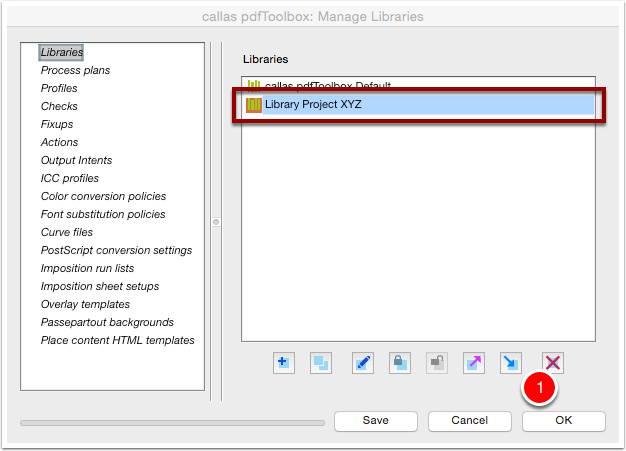 The new library "Library Project XYZ" is shown in the "Manage Libraries" list. 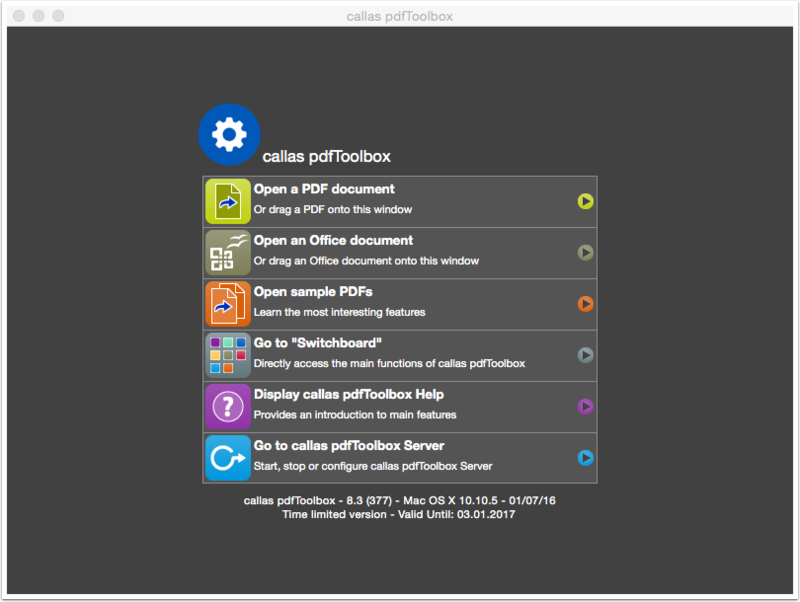 Click under the name Switchboard on "callas pdfToolbox Default". 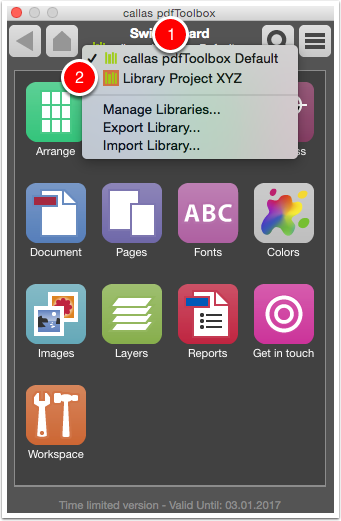 In the new library the background and text dialogs has custom colors. Select the new library "Library Project XYZ"
The new library is empty. In the left column, under the entry "Libraries" all areas are listed that can be set up in the selected library. Libraries: A list of available standard or custom libraries. Process plans: Combined Profiles, Checks, Fixups and Actions to apply on a PDF file. Here is the sequence important. Profiles: pdfToolbox Profiles that combined Checks and Fixups to apply on a PDF file. For example to convert a PDF to the PDF/X-4 standard. 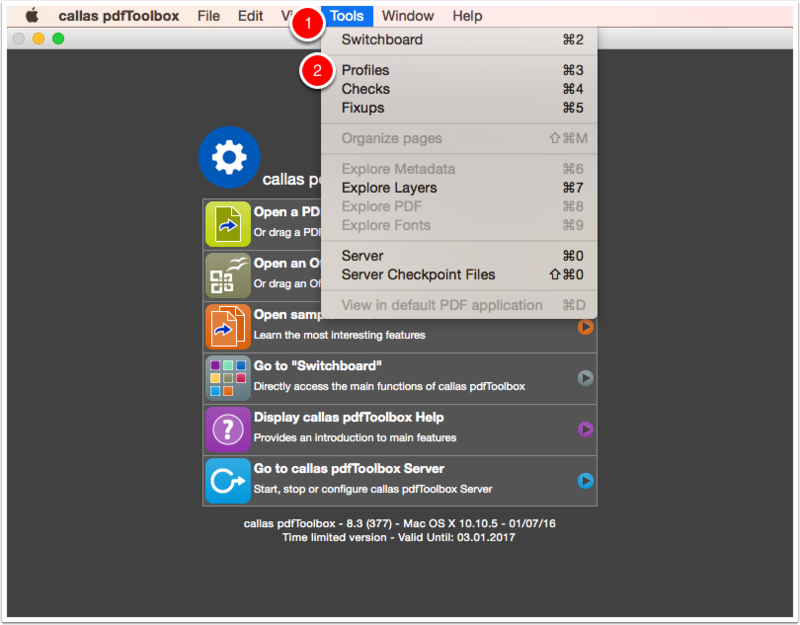 Checks: pdfToolbox Checks that investigate a PDF file according to some criteria. For example the thickness of text. 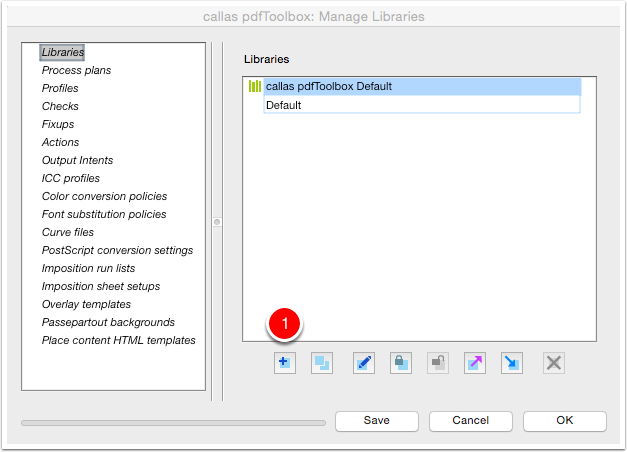 Fixups: pdfToolbox Fixups that fixed a PDF file. For example converting all the text into outlines. 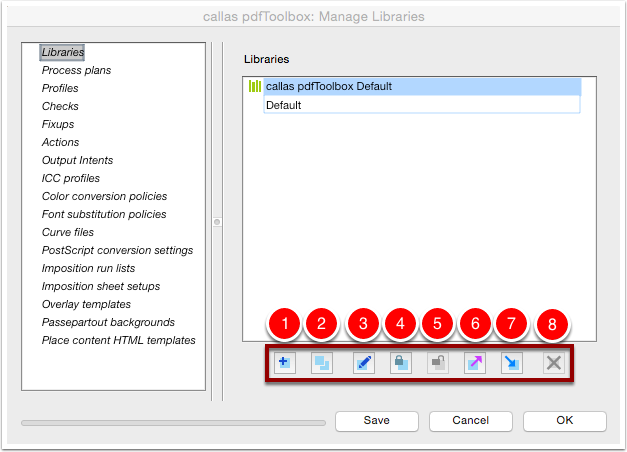 Actions: pdfToolbox Actions apply an action on a PDF file. For example creating an imposed PDF file. Output Intents: The output conditions. ICC profiles: ICC color profiles. Color conversion policies: Policies to convert colors in a PDF file. For example convert to "Office RGB". Font substitution policies: Policies about missing fonts. Curve files: Curve settings for tone value adjustments. PostScript conversion settings: Quality levels. Imposition run lists: Imposition scheme plans. For example to plan 8 business cards, double sided. Imposition sheet setups: Sheet configuration plans. For example 8 business cards on a A4 page size. Overlay templates: Overlay templates such as "Draft" or "Watermark". Passepartout backgrounds: Passepartout backgrounds such as "Sand paper" or "Stone". Place content HTML templates: HTML templates to add PDF content. For example adding the file name. Now we want to investigate the created library "Library Project XYZ". The new library was constructed as an empty library. 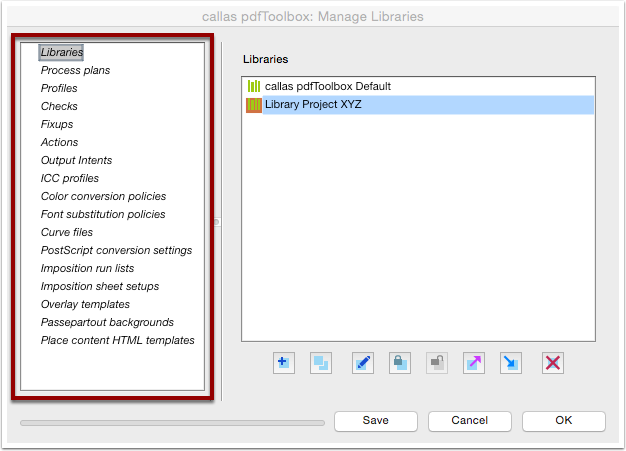 You can derive Process Plans, Profiles, Checks, Fixups and Actions from the callas pdfToolbox standard library (or another library if available). 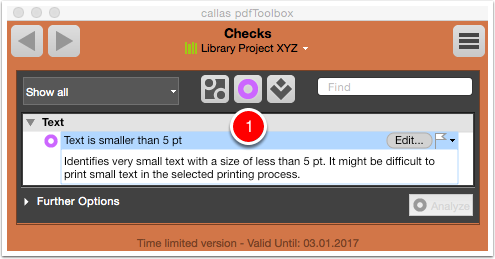 In this example we add the predefined Check "Text is smaller than 5 pt" from the callas pdfToolbox Default library. 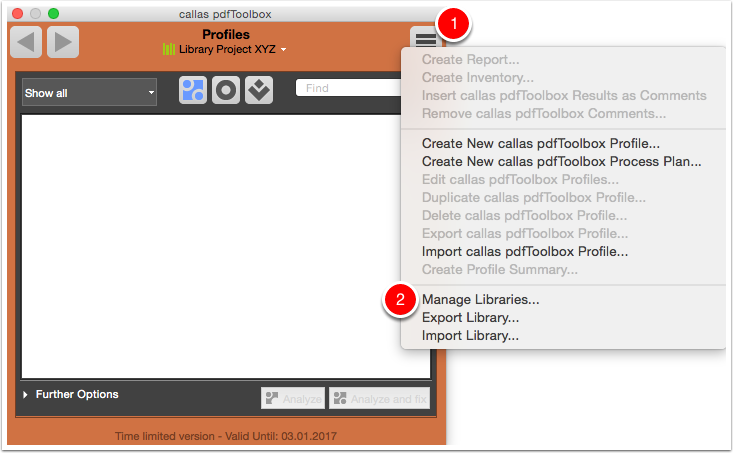 In the dropdown list select "callas pdfToolbox Default". 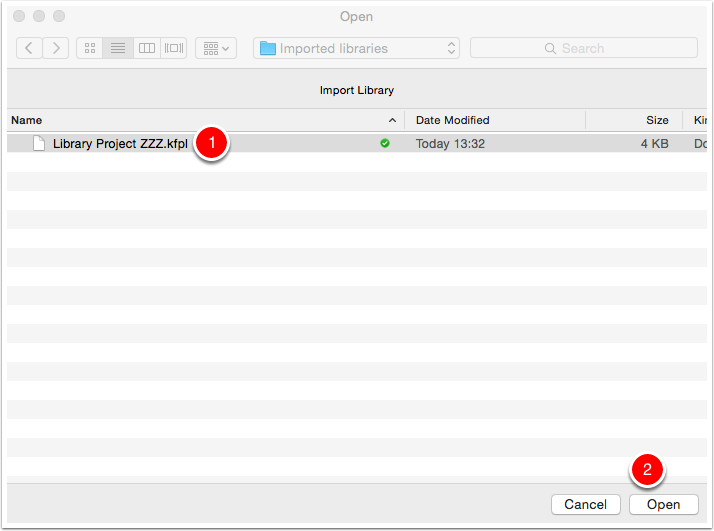 In the dropdown list select "Library Project XYZ". Select Check "Text is smaller than 5 pt". Click on the blue arrow button to add the Check in the library. Click "Save". Confirm that you made changes. 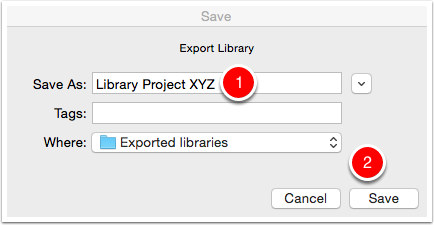 Save the exported library as "Library Project XYZ".